This grazing agreement creates a short term licence to graze a field. It can be used to graze any animal, from horses and other equines, to cows, sheep and other livestock. It should be used where the land is not used for business use. Most of our competitors sell grazing agreements that are either short term common law tenancy agreements or agricultural leases that restrict the tenant to using the land for the single purpose of feeding livestock. Using a lease to achieve the end is fine, but doing so gives the tenant certain rights at the expense of the land owner. For example, the landlord must notify the tenant of his intention to end the grazing lease well in advance and in a certain way. This grazing agreement is different, in that it is a contract to take what grows on the land rather than a licence to occupy. Because it gives the licensee no rights of occupation, the land owner concedes far fewer rights than he or she would do under a grazing lease. This agreement can be used for livestock of any type, including sheep, horses and cows. The legal background to grazing agreements is, in our opinion, quite interesting and worth a short note. Farm tenancies require the landlord to comply with the obligations set out in statute law that give and protect the rights of the tenant. The law attempts to rebalance the power between tenant and landlord. 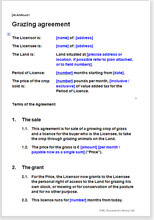 Loopholes in the law have been closed over the years, to the point where any contract that allows a land owner to receive payment in return for letting someone else occupy the land is construed as a tenancy agreement, even if the written contract is dressed up to look like a licence agreement. To make matters worse for the landlord, his faux licence is likely not to contain provisions that protect his rights in the same way that a proper lease would do, for fear of looking like a lease. This grazing agreement is neither a lease nor a licence to occupy. It is known in law as a "profit à prendre", and the effect of it is to grant a right to buy a crop and to take the crop using animals to graze the land. To qualify as a profit à prendre, a single specified crop must be sold (in this case grass) and the collection of the crop must take less than a year. For any type of animal, including livestock and horses. Note that this agreement does not permit other uses such as breeding or equipment storage. Both require a formal lease. This grazing agreement is confined to “taking a crop” of grass. If there happens to be a building on the land, a judge would assess the facts and decide whether the real arrangement was for a lease. For example, if there was an existing building which was used solely to shelter animals grazing, our opinion is that the deal would still be a licence. But if the buildings were used to store a tractor you would be safer to use a lease. If you want to let your land for more than a year, then you should consider using a farm tenancy agreement, or if the land will be used for non-agricultural business use, a land lease. You should enter into the contract “with your eyes open” as to the damage to the surface of the land which can be inflicted by over use and by wet weather. If the licensee is to graze 4 pet sheep on the land, the damage is likely to be very different to that caused by a herd of cows. You can help to protect your land by granting a licence for much less than a year, allowing the field or pasture to recover. Remember that different animals eat different plants. It might be a good idea to alternate the types of livestock allowed on the land so as to keep certain species of plants from overwhelming others. The terms of the licence should be kept very simple and must apply only for the purpose of grazing. Responsibilities for mending gates, and undertaking any long term improvement should be left unspoken as responsibilities of the landlord.